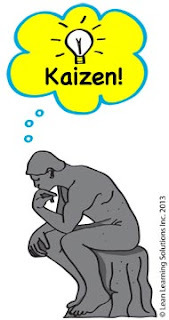 What's the proper role of the Kaizen/Continuous Improvement Office? More and more though, I think about the great Taiichi Ohno. "I am not just building cars - I am building people!" A splendid concept from a true revolutionary. Underlying this sentiment was Ohno's remarkable respect for people - expressed by challenging them to do their very best! I've been privileged to have such senseis, both at Toyota and in Aikido. But how does this help the corporation? Where does this show up on the Balance Sheet? Sadly, it doesn't - for now. Intellectual Capital means people - and their capability, creativity, flexibility, sense of urgency, knowledge, relationships and camaraderie. At companies like Google, Apple, Amazon, Facebook, Intellectual Capital dwarfs financial and physical assets. So how can we continue to ignore it? Our job is to create Intellectual Capital - by growing people.